Powered by ‘VIP Cars’, we are a leading Sofia Airport car rental company. We have established excellent customer relationships over the years by presenting our customers incredible Sofia Airport deals and discounts. We are the one stop shop to book a suitable car at lowest rates. We at ‘Sofia Airport Car Rental’ offer wide fleet of cars including economy, compact, mid-size, full-size sedan, sports and luxury cars. Being in alliance with the major Sofia Airport car hire agencies, with us you will find exclusive deals accompanying inclusions like liability insurance, theft protection and much more. 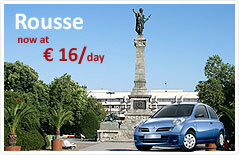 To hire a car at this Airport and numerous nearby locations is very convenient online with us. Online booking is a faster and hassle free way to reserve a car for your trip. You need to follow a few simple steps that include entering your rental details online, analyze various deals available and fix an appropriate deal. Rent a car at Sofia Airport from us to enjoy unbelievable deals and discounts! How to reach Sofia Airport?